Actress Lily Collins showed up to the 2013 Vanity Fair Oscar Party at the Sunset Tower Hotel wearing a gorgeous Adeler sapphire and diamond ring. The 23-year-old The Mortal Instruments actress looked fabulous rocking a Zuhair Murad dress. 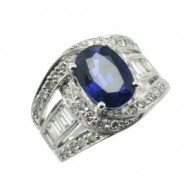 18kt white gold ladies Blue Sapphire and Diamond custom designed cocktail ring. The piece features a large 4.83ct royal Blue Sapphire gemstone that is prong set in the center of this ring and surrounded by a “swirl” or round brilliant Diamonds that are pavé mounted and branch off into four rows that form a split shank down the side of the ring. Filling the center of the split shank are a row of baguette Diamonds on each side. The total Diamond weight in this ring is 1.38ct. The Diamonds have a clarity of VS1/2 and a color grade of FG.